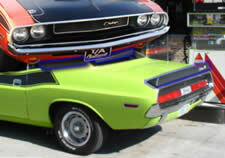 As we said before the Challenger T/A version differs greatly from the base Challenger. 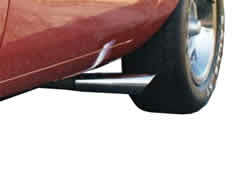 The T/A version had a different stripe, which was used in 1971 as the stripe used on most Challengers. The T/A also had a fresh air scoop mounted on the hood. The Challenger had a “duck tail” spoiler and front spoilers. Lastly, the Challenger T/A’s exhaust exits out the sides in front of the back wheels. 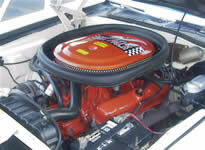 The Dodge Challenger T/A put out high horsepower with it’s 340 6 Pack V8. The T/A’s bore and stroke were 4.04 inches by 3.31 inches. The stock compression was 10.5 to 1. They used 3 two-barrel carburetors, which amounted to 6 barrels. The maximum horsepower from the factory was a whopping 290 bhp @ 5,000 rpm, and the maximum torque was 335 lb-ft @ 3,400 rpm. The 340 could accelerate the Challenger 0-60 miles per hour in 5.8 seconds, 0-100 miles per hour in 14.4 seconds, and race a quarter mile in 14.4 seconds at 100 miles per hour. The Dodge Challenger T/A put out high horsepower with it’s 340 6 Pack V8. The T/A’s bore and stroke were 4.04 inches by 3.31 inches. The stock compression was 10.5 to 1. They used 3 two-barrel carborators, which amounted to 6 barrels. The maximum horsepower from the factory was a whopping 290 bhp @ 5,000 rpm, and the maximum torque was 335 lb-ft @ 3,400 rpm. The 340 could accelerate the Challenger 0-60 miles per hour in 5.8 seconds, 0-100 miles per hour in 14.4 seconds, and race a quarter mile in 14.4 seconds at 100 miles per hour. Challenger T/A’s hood is a very unique feature that was available only to the T/A. The hood is made of lightweight fiberglass. What really sets this hood apart from all other cars is the hood scoop. The sleek design really blends in nicely with the rest of the car. Some might think that the scoop is “all show and no go”, but this hood scoop is functional and draws in fresh air. The hood was usually painted Organasol. It differed from the AAR because it didn’t paint the tops of the fenders and doors. They only painted the hood itself. The spoilers on the Challenger T/A also set it apart from other cars. The front spoilers are what they call “chin” spoilers. As you can see in the image the “chin” spoilers are located on the front bottom of the car. The rear spoiler is what is called a “duck tail “. It is located on the back end of the trunk lid. The AAR ‘Cuda also has a very similar rear spoiler. The exhaust on the Challenger T/A came out the side of the car. On most ‘Cudas (excluding the AAR), Challengers, and other Mopars, the exhaust exited out the rear of the car in a variety of ways. However, the T/A’s exhaust came out right in front of the back wheels, on both sides none the less. Before exiting out the side exhaust pipes though, it was routed through the standard muffer (which was mounted underneath the back seat). In 1970 Dodge made 4 to 5 TA’S with a Painted Tops one Blue with White top, Hemi Orange with Black Top, Lime Green with Black Top and Plumb Crazy Purple with White Top. Can anyone verify this to be True or tell me how I can get information concerning this.